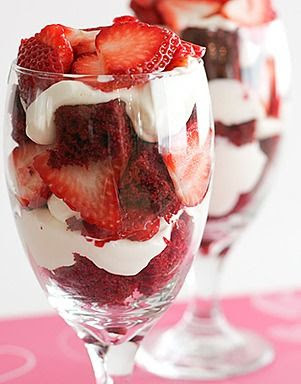 First up – this Red Velvet Trifle. I wanted to make sure I did some easy and some harder recipes this week, and this one was super easy – especially since it starts off with a box cake mix. You could definitely do a cake from scratch, but this shortcut works for this recipe. Both my husband and I gave this dessert 2 thumbs up. Way up. In fact, my husband ate 2 servings, he loved it so much!! The addition of the yogurt to the cream cheese is so delicious and brings something different than a normal cream cheese flavor. And a big plus is that these could be assembled ahead of time, so if you are having a romantic dinner at home.